Four Sisters Point nestles on a point on Lake Katherine, a clear, quiet, 600-acre lake in the North Woods of Wisconsin. Lake Katherine, "the Jewel of the North Woods," offers the best in fishing and water sports as well as a quiet serenity unique in the popular Minocqua area. Four Sisters point has a 40-foot pier in a quiet bay. With 400 feet of private shoreline, a private sandy beach, and four acres of private pine woods, there is much to explore. Fishing, water-skiing, swimming, and boating await sports-lovers. Nearby Minocqua has lively shopping, dining and entertainment. For a rainy day, there is a big stone fireplace, a TV with satellite and one with DVD/VCR, a small library and a collection of games, and WIFI. This is a great place to get away in the spring and fall, as well as summer. The sound of the loons, a cozy fireplace, beautiful views of spring or summer foliage all await you for a romantic getaway, a fishing break, or a secluded retreat. Spring and fall also offer a great value over the higher-priced summer months. For those who love to fish, Lake Katherine's 600 acres have a maximum depth of 30 feet. Visitors can bring their boats in from a public boat landing or use our rowboat to fish for muskie, panfish, largemouth bass, smallmouth bass, and walleye. You can fish from the dock as well. MINIMUM RENTAL PERIOD IS ONE WEEK. MAXIMUM NUMBER IN PARTY IS 8. We hope you'll visit and become part of our Four Sisters Point family! My grandfather first purchased this wonderful cabin in 1912. It's a great place to get together with other family members to share time and memories, and to keep old and make new traditions. Our family has been coming to this place since 1911. While my grandfather was living, we came up early every summer, and my father spent his 'vacation' making sure the place was ready for Granddad's summer there--woodpile full, maintenance done, etc. Hours after supper were spent singing to the tune of our Dad's old ukulele and playing cribbage with Granddad. It is easy to spend the whole time here listening to the loons, watching the chipmunks, looking for eagles, swimming, and puttering around. Going into Hazelhurst or Minocqua, both less than 10 minutes away, is fun, and there are also lots of other things to do in the area, but the chance to slow down enough to listen to the wind in the pines, watch the lake sparkle in late afternoon, and admire the sunset until its last rays disappear over the lake is the best. The huge, 500-sf. 2-level deck faces west to the lake and the sunset. The lake glitters like diamonds in the late afternoons, and sunsets are often breathtaking. You'll watch until the stars come out! The cottage is about 100 feet from the lake. There is a lake view from every room in the cottage, except the bathrooms. The dock is on our sandy beach in a protected bay, great for kids. The kitchen, the living room, and all four of the bedrooms have their own views of the lake and the pines. Wake in the morning to loons calling and the sun shining through the pines. The property has 400 feet of lakefront that wraps around the cottage. Swim from the sandy beach or sit among the pines to listen for the loons. The fireplace and space heaters are available if spring or fall nights are chilly. Blankets and pillows are provided, but guests should provide their own sheets, bath rugs, and towels. There are parking spaces off the driveway for three cars. Boats on trailers should be put in the lake at the town landing and not brought into the narrow circular driveway so trees aren't damaged. There are three off-driveway parking spaces. Boats on trailers should be put in the lake at the town landing and not brought into the narrow circular driveway so trees aren't damaged. The living room has a comfortable couch and three easy chairs. Everyone will want to gather 'round the fireplace for ghost stories and sing-alongs! lovely stone fireplace with firewood provided. In addition to the usual cooking utensils, there are barbeque utensils and plenty of marshmallow-roasting forks! There are plates, flatware, and glasses for 8 or more and all the cooking implements you'll need. The kitchen is old-fashioned but cozy. The kitchen table seats 7 (but you'll want to be on the deck most of the time). The deck has a table that seats 4 but lots of chairs and side tables. The kitchen table seats 7 and there's plenty of extra room on the deck, including a table that seats 4. 2 TVs. One Smart TV with satellite and one plays DVDs and videos only. 1 Smart TV with satellite. Free WIFI. This is the North Woods, so internet may have to be rebooted now and then. Our library collection includes books about Wisconsin, the woods, and fishing as well as popular novels. We also have some very old books for those interested in a little antiquity! There's a nice collection of games, from Trivial Pursuit to Scrabble to Taboo! We have a few lake toys for your use, including floats and noodles. We also have life vests for forays out in the rowboat. A rowboat is available for fishing, and we have plenty of life jackets. There's a long dock where you can tie up your own boat. Our nice-sized charcoal grille is just right for family dinners on the deck. The 500-square-foot, two-level deck adjoins the kitchen and provides a great lake and sunset view. There's even a fire pit on the deck for marshmallow roasting, sing-alongs, and ghost stories. Access to the cottage is up a series of 12 steps. There is also a gentle path up to the back door that is not paved. Please limit smoking to the deck and use ashtrays. * Fishing boat (rowboat) * Private 40-foot pier * Private beach, deck * 400 feet of private lakefront * Lake view from every room * 4 acres of private pine woods * Full kitchen (cute, but not too modern) * Outdoor firepit * Deck firepit * Bedding (blankets and pillows for 1 queen, 2 double, 3 single beds); renters provide their own sheets and towels. * Well behaved pets allowed * Cleaning fee is additional; renters must pay for cleaning or leave cottage clean. We always enjoy staying at Four Sisters Point. The cottage is a comfortable blend of rustic and modern that has been lovingly cared for. It's spacious enough for our group of 8 (ranging in age from 2 to 75) but still feels cozy and welcoming. Our early September trip was later than previous visits but we were treated to some gorgeous fall foliage as the golds and reds of autumn were starting to pop out against the green pines. The days were still warm and pleasant and the brisk twilight air was perfect for relaxing around the deck’s fire pit to watch the sunset over the lake. We rarely wanted to leave the peace of the Point but we spent one day in nearby Minocqua exploring the shops and enjoying cheese curds, walleye and local beer. We also picked up some amazing smoked fish, corn and local honey in the Farmer’s Market at a nearby park. We’ve had the pleasure of staying at Four Sisters Point several times over the past decade and are looking forward to our next opportunity to share this special place with friends and family. Thank you, Barbara! I'm glad you tried a fall week and enjoyed it so much. September and early October are great times to be at Four Sisters Point--the firepit, as you mentioned, fall colors, the great stone fireplace--crisp nights, nice days. Town and restaurants are less crowded too. Hope you'll come again soon! Coziest, loveliest cabin! Perfect getaway. We loved our stay at this cozy, lovely cabin. The location on the lake is the absolute best for a dazzling sunset each evening. Unless it's raining, in which case it's a perfect place to cozy up by the fire under the pines with a good book. The location is close to town and to numerous activities, but on a more peaceful lake, perfect for a quiet getaway. The cabin is well stocked with linens, very clean and well maintained, and extremely well-managed and organized. All the directions were very clear and our stay was very easy. 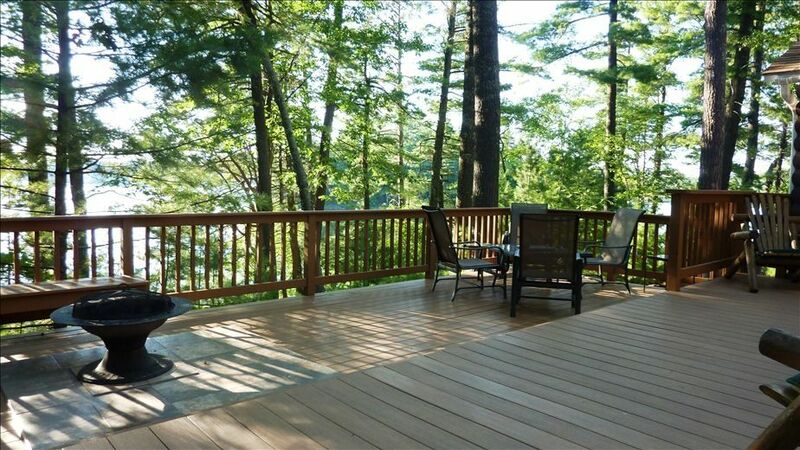 The large deck is also so beautiful, and a perfect place to gather around the fire pit with family at night. There are many activities nearby as well, including local theater, lumberjacks shows and restaurants, ski shows, canoe trips, raft trips, bike trips, and lots of hiking and boating. I would definitely recommend staying here, and hope to be back here again very soon! Thanks for the great review! We were so happy to have you share our bit of heaven. I'm glad we were able to solve your problem with the linens for you this time, but remember to bring your own linens next time--we don't normally supply linens. Hope to see you back with us soon! I've stayed at Four Sisters Point several times and am always blown away at how cute the cabin is and how much care Mary takes for the comfort of her guests! I'll be back many more times! Thank you! We love it when our renters come back and become part of our Four Sisters Point family! I have stayed at Four Sisters Point several times over the years, and it keeps getting better! The cabin includes all the touches and amenities of a family place, maintained with care, skill, and love. There is plenty of space to accommodate guests in comfort, and yet the cabin still feels cozy. The extensive deck is fabulous! Lake Katherine is quiet and lovely--perfect for swimming, canoeing, fishing, and more. This spot is a great base for taking in all that is offered by the North Woods of Wisconsin. This cabin has a great location and we love coming here! The view of the lake is amazing from the deck, kitchen, and many other places in the cabin and all over the property! The cabin itself has everything you will ever need - both old and new - comfy beds, micowave, tv, internet, a great fireplace, 2 bathrooms, 4 bedrooms, a fireplace, parking spaces, this place has it! Great for families or groups, plenty of beds and space. The owner has done a great job with this property and has great contact - we will be coming back again next year! the tourist things and a "dinner out" for grandma and grandpa at one of the great Northwoods restaurants. We have been at the cabin in June, July, and August and they have all been great stays. We truly enjoy the privacy at Four Sisters Point and how Mary has been able to keep the quaint "Up North" cabin atmosphere while adding the modern things that we enjoy. We're looking forward to future stays. Renters must leave the cottage clean or can arrange with the property manager to pay for cleaning. If you must cancel, your deposit is fully refundable if the week you reserved can be re-rented. If not, none of your deposit can be returned.